Ok, trying to learn something about mechanisms.. I have to work with subassemblies because I have a lot more components than it is represented in images. Now what´s the best way to deal with this? 1. 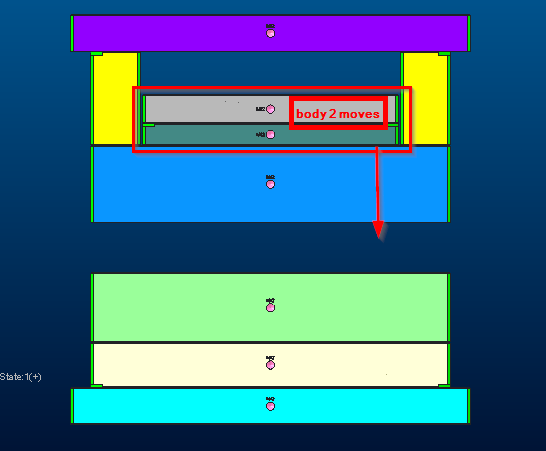 Create a assembly for body1 and inside, another subassembly for body2? Both options should work. I would set up the assemblies the same way they are being built. I would use some sub assemblies. Question, What's driving the sub systems locations (springs, Motors, etc)? When you look at the pictures you would have to have a spring, linear motor system or something to drive the postions of the components as gravity would not allow the system to work as shown. Need more definition as to what's making the parts move? I don´t have the MDO extension, I´m using the free version. So I don´t have springs neither gravity. I just just want to create a simple kinematic analysis, a kind of a animation, without forces calculations. For moving the parts I´m using a servo motor. I´ll take a look at the table driven motor as you suggest. I have tried both ways I mentioned, and none seems to work properly. I have to spend some more time on this. 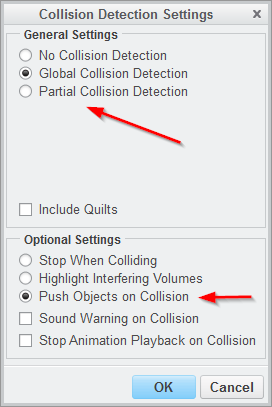 Do we, as non-MDO owners, have collision detection? Maybe the limits in your constraint can be your stop if collision is not an option. Cam motion gives you a bit of added capabilities too. User defined and table defined servo motor profiles are pretty simple. Since you are just visualizing this, the table driven it real easy to set up in a linear fashion. With the abrupt cutoff of the one part, you do need something to interrupt a nice cosine sweep. This can be done by getting data back from your assembly and using that in the User definition. Pick your poison on how you want to accomplish this and I'd be happy to help. I played with this using cams. Creo really should be more forgiving in this effort but it is not. It took me a couple of attempts to get it to pay attention to my intent. Attached you will find a full version Creo 2.0 assembly and an animation gif. Also included is the mechanism analysis file ready to run. 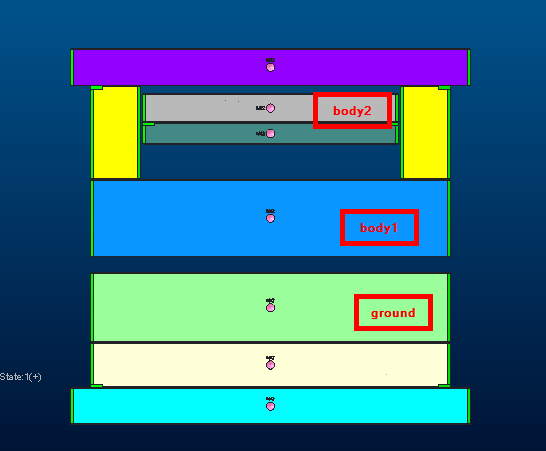 We have collision detection but doesn´t seem to work when we run a analyses. It only works when we drag the components manually. Thanks for all the info provided, I will analyze it a little bit now. From the graphs, you can save the data. With the data, you can create servo motor table profiles. I assembled the blue part to the orange one, and the green part to the blue one with planer constraints. Then, in the Snapshot dialog box I did a mate offset of the lower ouside surface of the blue part to the upper surface of the orange part.. 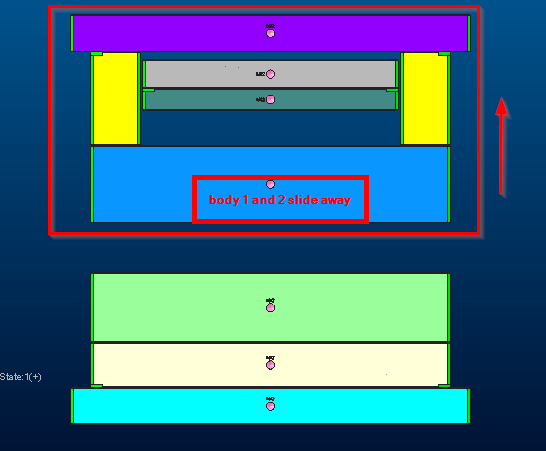 I also did a mate offset of the upper surface of the green part to the inside upper surface of the blue part. I took a snapshot of this configuration, then modified the offset distance of the blue part to the orange part and took a second snapshot. Finally, I changed the offset distance of the green part and took a third snapshot. Using the three snapshots, I created an animation. Thanks for your contribution, but it doesn´t suit my needs. I know that I may create the animation with snapshots or exploded views. That´s how I have been doing it so far. Sometimes it is easier to simply stitch together several animation. It is also fairly easy to timeline different servo motor actions. If each action is unique along the timeline, then this is the easiest to accomplish with individual servo motors and no specific links. The user defined profile will let you set the action along the timeline. it gets a little more tricky is you need soft starts and stops as you will want to program in sine curve equations or add additional steps to mimic the soft start/stop.